The road has taken us quite a few kilometres since we were last able to post. Every day on this trip flies by and every day is so full it feels like a week in itself. So having crossed into Spain only yesterday morning, it already feels we’ve been here ages. We drove straight from Pyla, on small roads, to Bayonne, via a lunch break overlooking an amazing surf beach, miles of sand. The wind seemed a bit strong, as the lone kite surfer made it look very hard work as he fought his way up the beach, just to be dragged back through the water with brief interludes of standing. 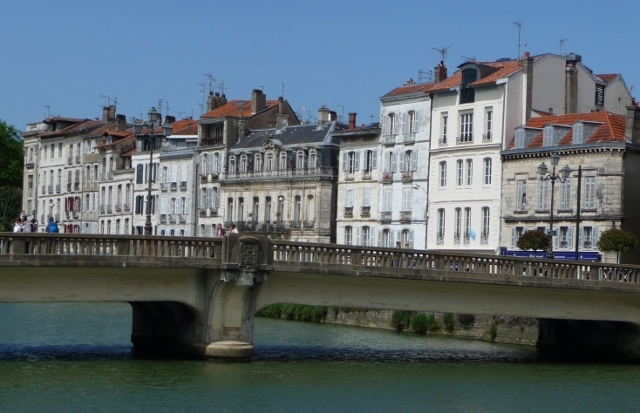 An afternoon getting lost on foot in the centre of Bayonne wasn’t enough – a laid back, beautiful city with a nice vibe and gorgeous tall old shuttered buildings lining narrow streets, and intriguing bars. We’d have loved to stay longer, but wanted to cross into Spain. 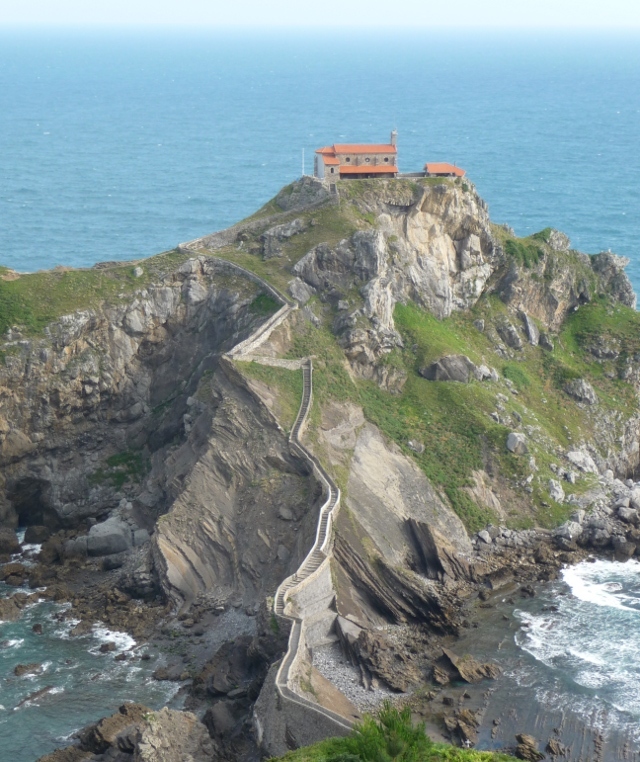 This morning started with an early trek to the hermitage of San Juan de Gaztelugatxe, a small church on a rock off the shore. 200 steps, once you’d fought your way through the undergrowth down the hillside from the carpark. We could see it from the camping spot, and it was very well worth the effort – beautiful, surrounded by waves crashing against the rocks. 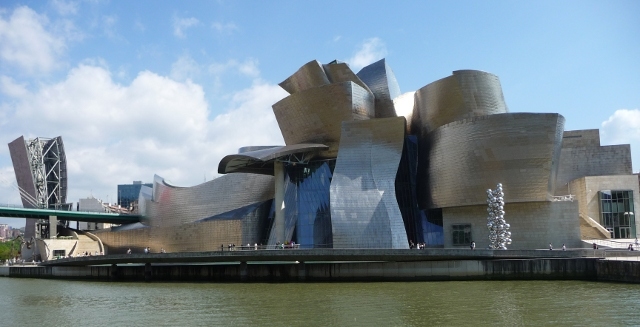 After checking out and rejecting a couple of the few campsites near Bilbao, we headed straight for the city on the main road. A toll tunnel was signed to the centre, so we took it, and emerged with great surprise on a fantastic new bridge right next to the astonishing Guggenheim museum. We parked easily, and spent the afternoon wandering through the city. We’ve found a decent, if crowded, campsite (they’re much scarcer here than France) and will catch the bus back to the city tomorrow, to go round the museum properly. This entry was posted in By Country - Spain, Travel stuff. Bookmark the permalink. well i arrived in the early morning at sunny Haddenham. Once i negotiated the pot holes on the estate road i got out of the car and found my way to the bland blue doors of the office. i struggled up the stairs and to the kitchen. with my fine refreshing beverage in hand i meandered across to my desk and began work. i spent the day flitting between the workshop where the kilns were pumping out 600 degrees and my desk dealing with stuff. lunch was a fine moment of warm salad and tea. We won’t tell you that we’re sat in the sun, outside the Guggenheim, having just finished delicious fresh orange juice and a tortilla then.